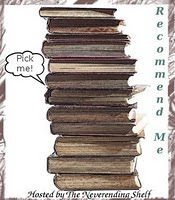 Kate at the The Neverending Shelf is hosting this fun weekly meme Recommend Me where you recommend a book, old or new, that you really enjoyed. To play along, grab a favorite read and tell us about it. You can include your thoughts about the novel, its summary, your favorite memory related to the novel. I've been thinking of what should I recommend for this week. so many books but I just don't know which one is good at least. But last night, I saw a trailer of Johnny Depp in Alice in Wonderland, which remind me he acted as Capt. Jack Sparrow in Pirate of Carribeans. What I'm trying to say is that, there's a book which I really adored when I was a kid, and I like to read it thousands of time; The Treasure Island. It's a hardcover and have very beautiful pictures, graphics and it was the one I sneaked out from my aunt's house. Ooopss! But yeah, I made one horrible mistake. Only a few month later I told her that I took the book. I was so glad she don't even scold me! *LOL* Instead, she gave me the book and asked me to take care of it. I was 10 and of course I was super delighted and read it almost everyday! Actually, I just looking at the pictures, and read a few words I knew, because at that time I don't really know to read English. Only a few familiar words, dictionary at another hand, and always keep referring to it. Jim Hawkins is such an adorable and courageous. I think of him as a cute boy whenever I read the book. Have you ever read Treasure Island? Yeah, I haven't read it either but it's one of those books that you have to read in your life time! Treasure Island, what a great book! It definitely brings back memories of sitting in the backyard with glasses of lemonade on summer afternoons with piles of books. I think I read Treasure Island the summer between 7th and 8th grades. I haven't read it since then, so it might be time for a reread. I'm here from Friday Follow. I have yet to read Treasure Island, but have been meaning to for so long. What a great story about your book! Such a great pick! Treasure Island is definitely a classic and one I think a lot of readers really grab hold of. Great review! I had to read it in high school, and unfortunately, I never liked books I had to read for school. I bet I would have liked it if I had found it on my own, like you did. I should give it another try sometime.